The Blues improved to 15-5-3 (.717) on the road, which stands as the NHL's best record in terms of points percentage. 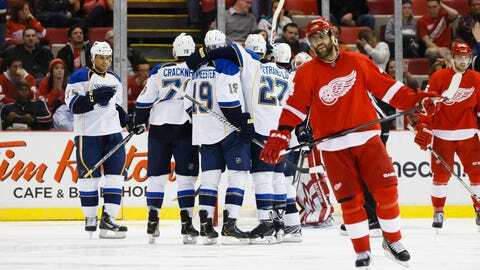 The St. Louis Blues found their mojo in Motown on Monday night. The Blues pieced together the kind of effort coach Ken Hitchcock has been seeking with several players stepping up in a 4-1 win against the host Red Wings in Detroit. The Blues (33-10-5, 71 points) snapped their two-game losing skid and got their four-games-in-six-days road trip off to a good start. Three of the Blues’ four goals were scored by defensemen. Barret Jackman tallied his third goal of the season, and second in two games, early in the second period and then Kevin Shattenkirk followed with a power-play goal just 80 seconds later. Jay Bouwmeester scored early in the third period on a long shot that deflected off a Red Wings player and gave St. Louis a three-goal advantage. The Blues have received plenty of contributions from their D-men this season. Alex Pietrangelo, Shattenkirk and Bouwmeester each entered Monday’s game ranked among the top 12 defensemen in points. After scoring two goals in the second period, St. Louis has now outscored its opponents 62-31 in the second period this season. The 31 goals allowed is the lowest mark in the NHL for the second period, while the 62 scored is fourth most in the league. For the record, the Blues have now outscored opponents 46-43 in the first period and 56-29 in the third period. These statistics don’t tell the whole story, of course, but certainly point to a continued emphasis on starting out games strong. St. Louis is now 28-1-3 when it scores first, like it did against Detroit with Magnus Paajarvi’s rebound wrap-around goal. The Blues’ busy stretch of seven games in 12 days makes it likely that both goalies, Jaroslav Halak and Brian Elliott, will get plenty of work as Hitchcock splits up their starts. Monday night was Halak’s turn between the pipes and he performed well by stopping 22 of 23 shots (.957) from the Red Wings. Halak (20-7-3) has now won three of his four starts since he missed time with the flu three weeks ago. He has stopped 102 of 107 shots (.953) in those four starts.